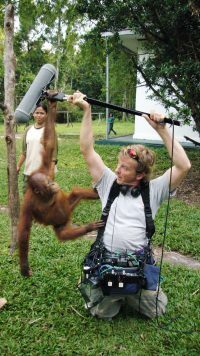 Richard Maxwell (AKA Max) joined BOVTS in 2007 as Head of Film and Television Production after freelancing for 18 years as a Producer/Director and Cameraman working mainly in natural history and documentaries. He has a BA in Communication Studies and a Postgraduate Diploma in Film Production Studies from CJS at Cardiff University and his broadcast credits include the Great British Bake Off (series 3 & 4), Human Planet, Tribal Wives, Dr Who Confidential, Skint, Comic Relief and Children in Need. Industry awards include a BAFTA for Great British Bake Off. Broadcast Awards include Best Documentary Series for Tribal Wives, an RTS Craft Award for Camerawork/Lighting Camerawork and a Grammy nomination for Coldplay Live. Max still continues his professional practice alongside his teaching duties with recent credits including shooting and directing a series short films for The One Show and Country File. He has also taken on the role of ‘Carbon Tsar’ at BOVTS driving forward issues of sustainability in the curriculum as well as carbon reduction across the school.